Years ago an Italian chef revealed her secret ingredient to me – that little something special something (or somethings) that adds magic to a dish. While my ‘secret ingredients’ vary from dish to dish (Elaina’s was a pinch of crushed red chiles), there’s always at least one hidden ingredient that adds oomph, but can’t be readily identified – such as scant amounts of chiles, vinegar, citrus, concentrated stock, tomato, herbs, etc. 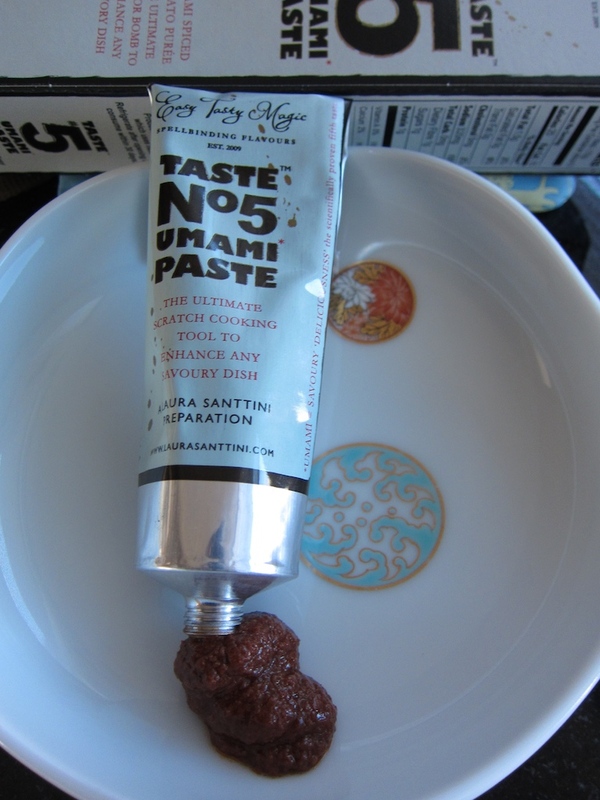 Just recently I discovered a new one – Taste #5 Umami Paste – and I’m pretty excited about it! You’ve probably heard of umami, the fifth taste sense that refers to an overall savory deliciousness certain foods possess. Classic examples are meats, fish, mushrooms, cheese, vegetables, stock, etc. Umami is for real, and bringing it out in dishes is the goal of every cook. It’s that ‘certain special something’ that keeps our head down and that spoon going while we shut the world out and savor a special dish…. That depth of flavor in a great stew, a rich lamb or veal shank, or a great bowl of real ramen soup… The heavenly satisfaction of porcini mushrooms, truffles, parmesan cheese, or prosciutto di parma. Umami is the world I want to live in! My initial test with Taste # 5 was a speedy pizza sauce – and it was fabulous! My first tube also made it’s way into a beef stew, a split pea soup, a Thai pud thai and a pasta sauce – and in every case my wife and I tasted before and then again after and were pleased because it generally increased the savoriness, deliciousness and overall ‘sexiness’, without us being able to discern exactly why. The ingredient list includes tomato paste, anchovy, olives, balsamic vinegar, porcini mushrooms and parmesan – how can it not be great! The package has lots of great usage suggestions and it can be used raw or cooked. Start with a little squeeze, taste and add more, etc. Pick up Taste #5 Umami Paste at any of our markets – it’s next to the tubes of tomato paste. I have no doubt you’ll find a variety of great uses for it – it’s definitely a new favorite in my kitchen! Buon Appetito – Salute!